COWBOYS & INDIANS The Strange Life and Legacy of Karl May. The Karl May Connection, from the summer 1995 edition of Umlaut. German Cowboys Create Lubbock Town (see page 9), from the fall 1998 edition of Umlaut. This edition also contains several other interesting related features. 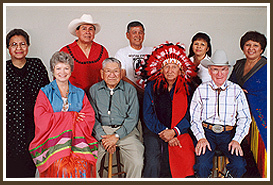 Dr. McClain (seated far left) with members of the Quanah Parker family along with Alvin Davis (seated far right). The International Karl May Symposium in Lubbock, at Texas Tech University and in conjunction with the International Cowboy Symposium and Celebration, was a major event in September 2000. The Symposium spanned more than a week, and was attended by scholars from Germany, United States, Switzerland, Austria, and Japan. The spectacular opening of the event included a special address and prayer by the grandson of Quanah Parker. Also see the brochure from the Symposium. The Karl May Congress convened in Wolfenbüttel, Germany, on October 8, 2011. At the event, hosted by the the Karl May Society, Dr. McClain delivered the announcement regarding the permanent loan of the traveling panel exhibit in Germany to the Karl May Haus Museum (see more information below) in Hohenstein-Ernstthal. Please visit the photogallery, which has a great photo of Dr. McClain with the Director of the Museum, André Norbert. Karl May Haus, in Hohenstein-Ernstthal, Saxony, Germany, is the birthplace of Karl May, and today the restored and meticulously maintained house is the modern day literary museum and research center for Karl May books, materials and other items. Dr. McClain is an appointed corresponding member of the Advisory Board. The Wall Street Journal featured a front page article about Karl May in its March 11, 2001 issue, in which Dr. McClain was interviewed. Please visit the photogallery and click on the photo of the article, which will produce an enlarged, readable image. The incredible account of Karl May, and his vivid stories of the American Southwest, astonish most people when they learn of them. A native German, he penned adventures about two fictional characters, "Old Shatterhand" and his Native American blood-brother "Winnetou," which fascinated contemporary readers of the time, and have created a modern-day following nothing short of a phenomenon. In addition, his descriptions of the Llano Estacado, where his stories were set, often have an eerily accurate alignment with reality. This is despite the fact that Karl May never travelled to the American Southwest.